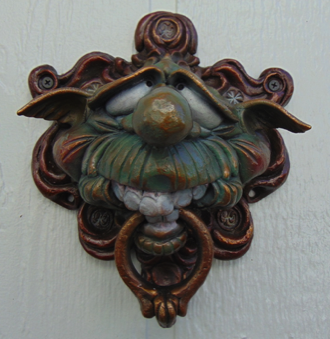 These bronze door knockers are truly heirloom pieces that will convey a life of whimsy and humor generation after generation. Virtually indestructable, they can be a treasured object to be passed along through family descendants, gracing entryways for years to come with a unique and fun welcome for visitors. Originally crafted in clay and designed to meet the special demands of bronze casting, the ceramic piece then has a mold made to allow for the casting of a wax rendition of the original piece. Next, the wax "positive" is covered in a refractory ceramic "shell" then heated to melt the wax away from the shell leaving the hollow cavity that would accept the molten bronze. Once the molten bronze is poured and allowed to cool the "shell" is broken away revealing the bronze version of the original clay design. After cleaning the surface it is given a patina to create the desired coloration and "age." The casting is done by one of the best art casting foundries in Colorado. The foundry's long tradition of casting fine art works over the years guarantees a product of exceptional quality. 7 11/16" wide x 8 11/16" tall x 4" nose tip to back. 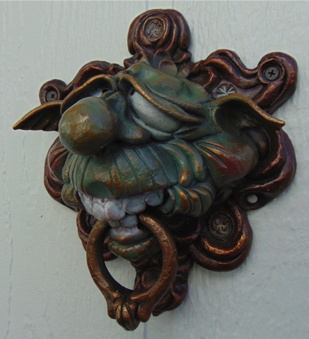 Each door knocker is cast specifically for each order. There is no stock available and the number of castings will be limited. The price of the door knocker will be determined by the cost of the foundry's casting at the time of order. Production time will be determined by the foundry. All orders require a 50% deposit with the order. 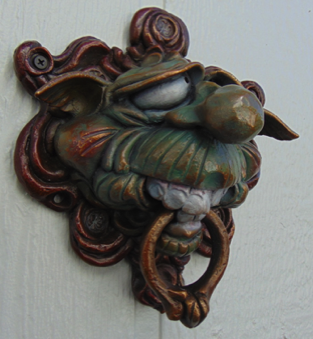 Custom orders for bronze door knockers in the shape of other characters is always an available option. Pricing will be given upon request and discussion of the proposed project.